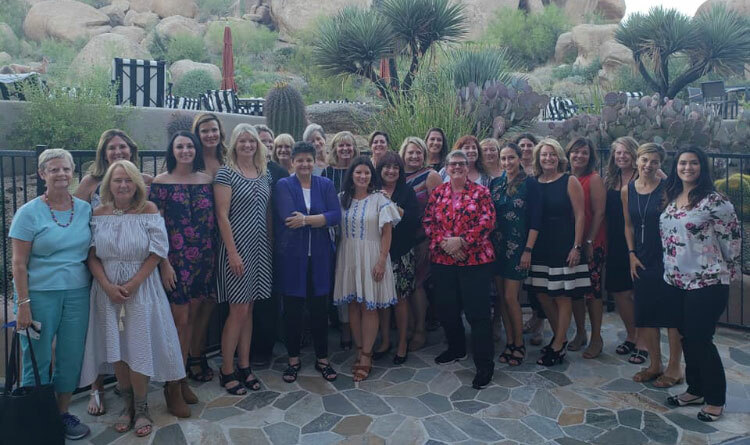 Last week’s Women in Residential Construction convention in Scottsdale, Arizona was a thrilling event to attend! The location was beautiful, the speakers were inspiring and I was happy to network with so many passionate, dedicated women from across the country! Many of our local challenges are problematic nationwide. Every builder/remodeler that I spoke to has the same issues, which all stem from the labor shortage. Whether it be increased time required for quality control, job timeline increases, and price increases for labor, we all struggle with paying more for work that takes longer. I didn’t come away with the “magic bullet” solution, but it was great to know that we are not alone! I may be peeking into this picture from the back row, but I was front and center networking with all of these amazing women. There was a lot of networking at this conference, which helped me feel more included in a traditionally male-dominated industry. I would like to bring that feeling home, and I plan to work with my Auburn/Opelika network of passionate women in the industry to establish a local chapter of NAHB’s Professional Woman in Building. Together we can speak at local educational institutions and help girls and women feel more comfortable going into our field. It wasn’t all work in Scottsdale! We played poker one evening with Poker Divas. This organization gives women an edge by teaching assertiveness, leadership, and negotiating skills through the fun of playing poker. While I certainly don’t suffer from a lack of assertiveness, this event was fun and a great reminder that we can always be bolder and sharpen our business skills. Learn more about Poker Divas by clicking here! I loved the fantastic speakers at this conference. My main takeaway was a greater sense of what has always guided me. “Do the right thing” whether you are a woman in a man’s field or your pay or level of respect is less than your male counterpart. With this approach, I am able to gradually bring attention to injustices and take an active role in rectifying them. “The Confidence Code: The Science and Art of Self-Assurance—What Women Should Know” Katty Kay and Clair Shipman. I am currently reading “Give and Take-A Revolutionary Approach to Success” by Adam Grant and I definitely recommend it! « Design Assistant Lilly Rezutko Joins Our Team!